This post was originally published in July of 2017, and has been updated with more information and resources, including a solvent cement joint burst test video. When installing chlorinated polyvinyl chloride (CPVC) piping systems, you have a few different options to join the piping and fittings. Depending on the pipe size, the pipe and fittings can be threaded or flanged together, each offering a strong, durable union. However, for most applications, Corzan® Industrial Systems recommends solvent cement welding. Solvent cement is not glue. Instead it is a fast, easy installation process that uses solvents and resin to chemically fuse the pipe and fitting together at a molecular level, essentially creating one continuous piece of plastic. In fact, solvent cement is the only joining method recommended for system features like expansion loops because it allows the pipe to bend and move without breaking or weakening the joint seal. To ensure the solvent cement is applied properly throughout your process system, we've put together the following dos and don’ts to remember throughout the seven step joining process. If the provided solvent cement installation do's and don'ts are followed, see how reliable the joints become by watching the burst test video below. Can Corzan CPVC Piping Be Buried? This post was originally published in November of 2017, but has been updated to be more comprehensive, including a video of CPVC during an impact test. Whether used for general drainage, fire suppression, mining, or another industrial application, CPVC piping systems may need to be run underground. Most concerns about underground CPVC usage arise from incorrect assumptions about CPVC’s physical properties, specifically impact resistance. Underground piping is exposed to: Various-sized rocks and other abrasives. The weight of the backfill and any surfacing material. Vehicle and/or machinery traffic (depending on the application). Corrosives found within the soil. Fluctuating, potentially extreme temperatures. 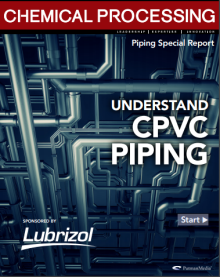 These potentially harmful conditions beg the question: Can CPVC piping be buried? This post was originally published in December of 2017, but has been updated to be more comprehensive, including a video of CPVC during a flattening test. Linear expansion is an unavoidable phenomenon that affects all piping material—including both metals and plastics. If a run of pipe is constrained at both ends, an increase in temperature will cause the material to expand, resulting in compressive stress. When this mounting force exceeds the material’s allowable stress, damage occurs to the piping system. During piping system design, architects and engineers must build in expansion loops to deflect this compression stress. In each of the three types, a right angle is required. Expansion loops, expansion offsets and changes of direction provide a linear direction for the pipe to move. But, which characteristics of the material enable it to deflect without causing damage to the pipe? In our previous post, we discuss the various formulas used to determine flow rate, flow velocity and pressure loss, as well as the factors that piping material selection plays in optimizing fluid handling. Read the full post, here. When designing industrial piping systems, engineers want a system that will minimize expenses over the long term. Excessive energy consumption increases costs and hurts the bottom line. Piping system design attempts to maximize energy usage by minimizing resistance to the fluid flow. The harder pumps have to work to move the fluid through the system, the more energy consumed and money spent. Understanding how pipe fittings, valves and strainers create resistance to fluid flow in industrial piping system helps engineers design more energy-efficient systems. In industrial plants, we often discuss what is being conveyed in the pipe as a function of system design. How a material performs with respect to corrosion and temperature resistance when interfacing with different fluids is a significant consideration during system design. Nearly equal in importance is how the fluid is moving through the pipe. Flow rate plays a significant role in determining a system’s longevity, as well as its day-to-day energy consumption. Understanding the efficiency with which a fluid can pass through a piping material is a significant step toward ensuring the long-term reliability and cost savings potential of certain materials. What Is Solvent Cement and Why Is It Used for CPVC Piping Systems? This post was originally published in August 2017 and has been updated with additional information and resources, including The Complete Solvent Cement Guide. Chlorinated polyvinyl chloride (CPVC) pipe and fittings are rapidly growing in popularity in both corrosive and high-temperature applications. One reason is, unlike traditional metallic pipes, CPVC piping systems are inert to most mineral acids, bases and salts found in mineral processing, chemical processing, power generation and wastewater treatment facilities. CPVC piping systems can be joined using flanging, threading or mechanical joining. But in many cases, the recommended method is solvent cement. Solvent cement is a fast, easy and highly reliable process that produces a joint stronger than either the pipe or fitting alone. Labor and related installation expenses can account for more than half of the total investment made in a piping system. In addition to specifying a material that will withstand the chemical and temperature demands of a process, consideration should be given to the installation process. Traditionally, engineers have relied on metal for industrial piping systems due to its durability and their familiarity with the material’s strength and weaknesses. The confidence this familiarity provides is used to help justify the extra installation labor and costs associated with a metal system. At the same time, CPVC (chlorinated polyvinyl chloride) delivers reliability in many similar applications, while also providing a much simpler, faster and less expensive installation. What is it about CPVC that creates these advantages over metal? For any industrial piping or ducting system, it is critical that hangers and supports are correctly spaced. Too much space between supports adds unnecessary stress to your system, causing deflection and sagging. Too little spacing, and you will incur unnecessary expenses. An advantage CPVC has over other thermoplastics is that at elevated temperatures it maintains its structural integrity, requiring fewer supports. Depending on the size of the system, this can create significant advantages across material, design and—most importantly—labor costs. CPVC is more efficient than other thermoplastics Although required support spacing is less for CPVC than other thermoplastics, it is not as rigid as traditional metal piping systems, requiring additional supports. However, in corrosive applications, the additional hangers are a small price to pay for extended system reliability. Ultimately, the number and spacing of hangers and supports will be determined by the system conditions and piping or ducting requirements. Every now and then, piping systems require upgrades or repairs, whether as a result of expected chemical corrosion or accidental pipe damage. Alternatively, industrial plants will often pilot test a small run of CPVC in an existing system to verify its compatibility and reliability. When the need to integrate CPVC pipe into an existing system arises, engineers have two priorities: minimize downtime and maximize value—including material costs, labor costs and system lifecycle. Whether your existing system is CPVC, another thermoplastic or metal, CPVC piping may be the ideal replacement solution thanks to its chemical resistance and compatibility, high heat distortion temperature and pressure rating. Fortunately, integrating CPVC into an existing system, regardless of the existing material, is a relatively easy, straightforward process. Sodium hydroxide, commonly known as caustic soda, is one of the most common industrial chemicals. A versatile alkaline, caustic soda is highly reactive and effective at breaking down certain compounds. Common caustic soda applications include the: Pulp and paper industry for pulping and bleaching processes. Wastewater treatment industry for pH neutralization and wet-air scrubbers. Food and beverage industry as a cleaning agent. Personal care industry, such as soap making. Power generation industry for regenerating ion demineralization resin beds. Semiconductor industry for etching, plating acid neutralization and cleaning. Aluminum processing applications for dissolving compounds and extracting impurities. For processing and storage of caustic soda, metals—such as stainless steel or carbon steel—or thermoplastics—such as polyethylene, polypropylene, PVC, and CPVC—are often used. But the corrosive nature of caustic soda, especially at elevated temperatures and concentrations, can shorten the life of any industrial system. With proper pipe and tank material selection, industrial applications can prolong their useful life.